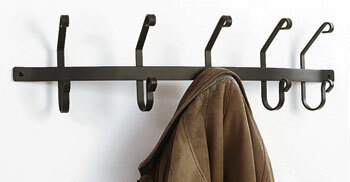 Our coat racks, hooks, are created from wrought iron and are wall mounted. They are finished with a baked-on powder coating to resist rust and ensure many years of use. Handcrafted in the USA and shipped direct from the factory located in Fabius, New York.